230 pages | 250 Color Illus. 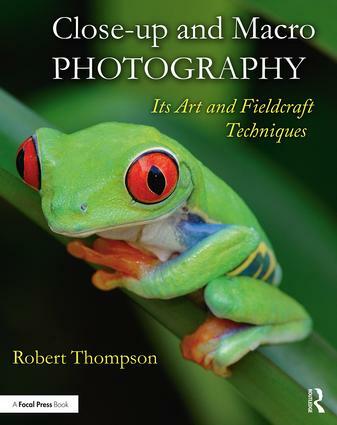 Focusing on fieldcraft techniques for macro and close-up photography, Thompson covers the vital but often overlooked skills necessary to achieve consistent professional results in the field. Case studies covering a broad and often challenging group of subjects from the seashore to your back garden form the core of the lavishly illustrated book. Biology, life history, subject behaviour and ethics along with best practice approaches are discussed in detail and underpinned with photographic tips. The book is divided into four sections—Digital Fundamentals, Fieldcraft & Methodology, Portfolio Case Studies, Digital Workflow & Presentation—covering the full photographic process from capture through to editing, captioning, development and storage are discussed. Moving beyond the surface-level approach to macro instruction, this book provides readers with techniques that work in the field. Illustrated with over 250 of the author's own inspiring images, this publication is a must for photographers, naturalists and anyone interested in improving their macro skills in the field. "Every image is accompanied by details of the camera used, lens, focal distance, aperture, and ISO. He reveals natural and artificial lighting techniques, as well as tricks of the trade, learned over years and years of dedicated fieldcraft. The emphasis is very much on ‘art and fieldcraft.’ But the author also emphasizes the importance of ethics in nature photography, something that we as photographers must adhere to at all times. His dedication to capturing his subjects in camera and his incredible knowledge is inspirational. Each page oozes with information that every bona fide nature photographer should know." "This is both a beautiful and intensely-practical book from a master of his trade, covering everything you could need or want to know in order to improve your close-up photography of butterflies, moths and other wildlife. Set out in four parts, the book covers all the fundamentals of digital photography and kit, fieldcraft and methodology, case studies and a brief section on processing and presenting your images. Lavishly illustrated with Robert Thompson’s superb images, not just of Lepidoptera but a wide range of subject from fungi to fish, this book is a joy to browse as well as a fount of information and hands-on tips." "Close-up and Macro Photography focuses on fieldcraft techniques and is divided into four neat sections: Digital Fundamentals, Fieldcraft & Methodology, Portfolio Case Studies and Digital Workflow & Presentation. Each section is generously illustrated with the author’s wonderful images, and the text is full of hard-won knowledge: who knew, for instance, that the pupae of some moths resembles polished wood? Whether you are a keen close-up photographer or a passionate naturalist, this book will satisfy your needs." "With Robert Thompson, you have an author and photographer at the top of his game … This book provides a very good level of knowledge without being inaccessible on the one hand or of being guilty of trivialisation on the other." "It doesn’t matter if you are a complete beginner, or an experienced enthusiast, this book sets the benchmark for all future books on close-up and macro photography. If you are a professional photographer, then this book is also of immense value to you. Why? Because it represents a superb example of what us amateurs want from a photography book—full of extremely useful advice set out in a clear and concise manner, together with stunning images throughout that we all want to strive for." Robert Thompson’s interest in natural history began during his childhood explorations of a large parkland estate where he grew up. He is a highly accomplished freelance natural history photographer, writer and author with a number of well-known publications to his credit on natural history and photography. He is widely acknowledged as a specialist in close-up and macro photography and was awarded a direct Fellowship by the Royal Photographic Society in 2012. He is also a Fellow of the Irish Photographic Federation. As an active conservationist and entomologist, he has worked on a number of high-profile natural history projects in his own country in conjunction with various government organisations. He also has a particular interest in dragonflies, butterflies and moths for which he has specialist knowledge. He has appeared on television and radio as a photographer, author and entomologist and been a contributor to other television programs relating to natural history and photography in Ireland. He lectures on photography and runs workshops in some of Ireland’s most picturesque locations and further afield.